I love Facebook. I’ve been working on a bibliography for the Lovatt Foundation in Kano, Nigeria, run by New Zealand poet and educator Fiona Lovatt, who’s been based in Kano for several years now. She’s exploring the local traditional bee-keeping practices but has only irregular access to a computer and a busy cell phone, dependent on solar power for charging. So I offered to help locate information. We’re kind of at a tipping point. We can’t really afford to lose that many more. We need to be really appreciative of all the beekeepers out there. But, as I searched, I also really really liked finding beekeepers’ wisdom via Facebook and news of their immediate day-to-day experiences. And images like the one at the top which I think comes from Chile. That’s me in old age, I decided. My Facebook friends and I debated whether the bee-keeper’s trusty steed is a donkey, a mule, or a horse. 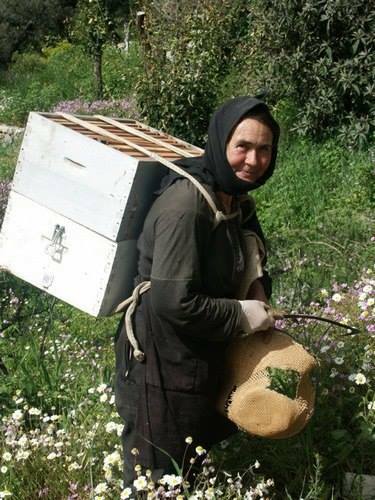 Here is this lovely woman again, in among the flowers, her hives on her back. From now on in this blog, I’ll refer more often to the Facebook info I find valuable.